Lava™ Ultimate is the world’s first resin nano ceramic material. Less brittle than glass ceramic, it resists chipping and cracking when milled. 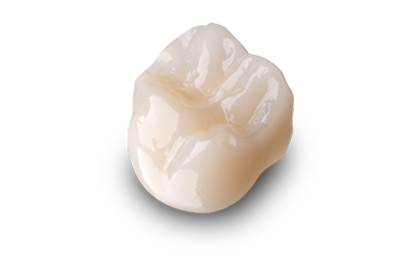 With a flexural strength of 200 MPa, Lava Ultimate restorations look and feel natural, and result in less wear to opposing enamel than glass ceramics. Lava™ Esthetic zirconia is so versatile, it can be used in almost any situation from singles, bridges with any combination of abutments and pontics, inlay bridges, Maryland type bridges and screw retained implants. Also an esthetic alternative to a PFM with metal occlusion due to limited space. "Shoulder preparation not needed. A mild champfer or a feather edge margin is good. 1mm buccal, lingual and occlusal reduction is ideal, but can go to .5mm in some areas, when reduction is limited. Minimum occlusal reduction of 0.5 mm; 1 mm is ideal. Adjustments and polishing: Adjust Lava™ Esthetic zirconia crowns and bridges using water and air spray to keep the restoration cool and to avoid micro-fractures with a fine grit diamond. If using air only, use the lightest touch possible when making adjustments. A football-shaped bur is the most effective for occlusal and lingual surfaces (on anterior teeth); a tapered bur is the ideal choice for buccal and lingual surfaces. Polish Lava™ Esthetic zirconia restorations with the porcelain polishing system of your choice. Lava™ Esthetic zirconia may be cemented using a resin reinforced glass ionomer such as Relyx Luting cement. When a greater bond is needed do to the lack of a retentive preparation, use resin cement like Relyx Unicam or Relyx Ultimate.